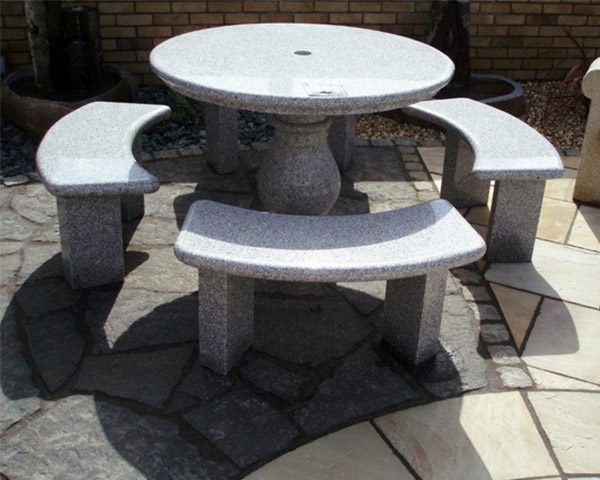 Our best-selling outdoor furniture set is the Round Table & 4 Benches set. Fully polished granite and thus 100% maintenance free. The table is 1.1m diameter and is drilled for an umbrella. Each bench is 87cml. The set weighs approx. 800kg. Photographed in Light Grey, this set is also available in an Oatmeal colour. This is our most popular outdoor furniture set! The Round Table and 4 Benches has quickly become our best seller, and it’s easy to see why. 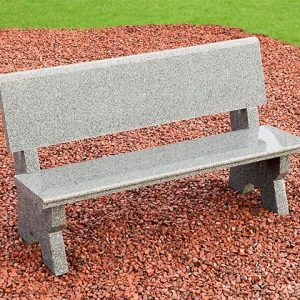 This set provides convenient seating for four people and is beautifully crafted from the finest granite to stand the test of time. You can place it on the patio or in the garden to dine al fresco with friends and family. The furniture set is also ideal for creating an outdoor dining, break areas outside commercial buildings and for public parks and gardens. Light grey in colour, the Round Table & 4 Benches includes a traditional pedestal style round table. Measuring 1.1 meters in diameter, the table has a thick tapered top and rests on a gorgeous footed base with curvaceous lines that are meticulously carved by our craftsmen. In the centre of the table is a hole for inserting a standard sized sun umbrella, so that you can easily add shade to your dining area. With this five-piece set, you’ll receive a total of four benches. Each bench is 87 centimetres long and is a crescent shape. 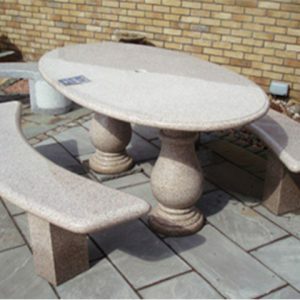 The rounded edges allow the benches to fit closely around the stone round table for comfort while dining. Curving the benches in this way maximises the seating space available while allowing the benches to take up less space. The curved seats are supported by angular block bottoms, which stand out against the gentle curves of the rest of the furnishings. Manufactured from solid granite rock, the Round Table & 4 Benches weighs 800 kilograms altogether. Every stone surface has been polished to a brilliant shine. Polished granite requires no weatherproofing or sealing and is 100 percent resistant to rain, snow, ice and freezing and hot temperatures, ensuring that this set will last a lifetime. You simply need to clean it regularly using conventional methods to keep it free of debris and looking beautiful.